I think it goes without saying that the sub$100 category of the IEM market now has some of the most intense competition. It is never a bad thing for the consumer since the price / performance ratio of these IEM has been driven to a historical height. The SQ that used to be priced around $150 just a few years ago can be obtained for almost half the price now. The only loser seems to be the big brands, which still insists on a more rigid pricing policy that makes them vulnerable to the flexible small brands when it comes to bigger bang for the bucks. Though there are still a large portion of headphone buyer who prefer to buy big brand just for the peace of mind, any smart consumer that does his/her research will know there are a lot of good offering in the market beyond the typical big chain stores’ offering. On the fact that you are reading this review is already a good indication that you are trying to avoid those IEM with too-colorful-of-a-packaging and mass marketing. Yes, you won’t eat bright and colorful fungi or animal lying around the forest in survival situation and thus you should avoid the same stuff when shopping for headphone as well. 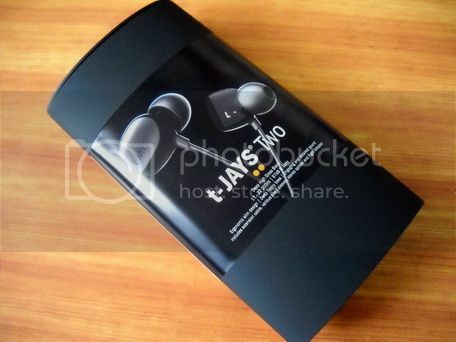 Packaging is identical among a-JAYS and t-JAYS. 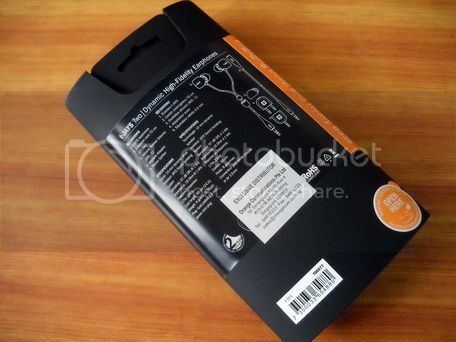 It is basically a plastic elliptical shaped container where the inner housing was locked inside an outer shell. 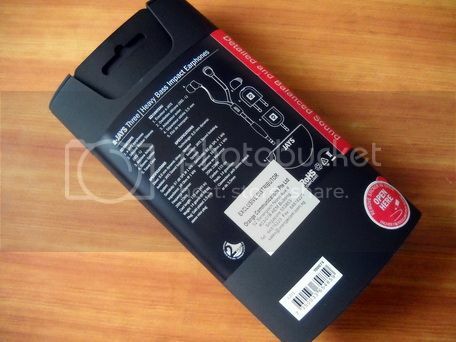 You will need to break the paper seal on top of the locking mechanism (a small hook) before you can open the package, ensuring you that you are the first person who has access to the inner goodies. These are possibly some of the best packaging in the sub$100 category. As one of JAYS’ specialty, build quality is among the best of its price class. A few things to note are that there isn’t any real strain relief on a-JAYS. 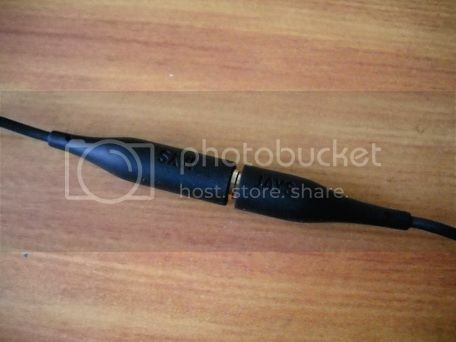 The flat cable does take stress better than typical thin cable and doesn’t seem that they will fail easily. 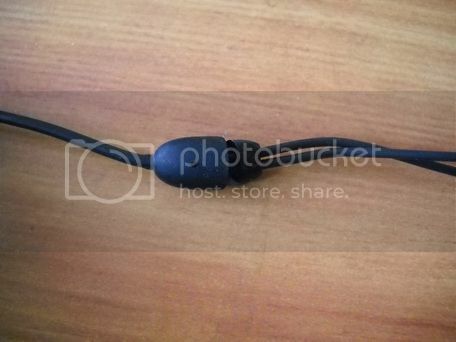 However, the extra weight of the cable becomes a little annoying before getting used to. 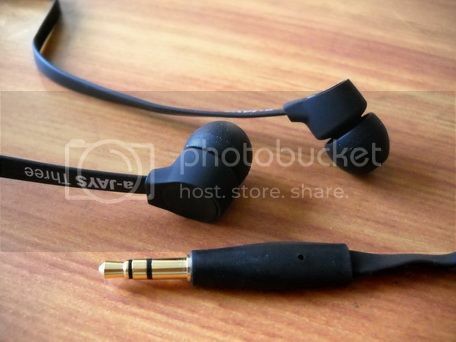 Also, since the cable is the rubberized type with wide surface, it doesn’t get tangled easily but tends to have just a bit more microphonics. 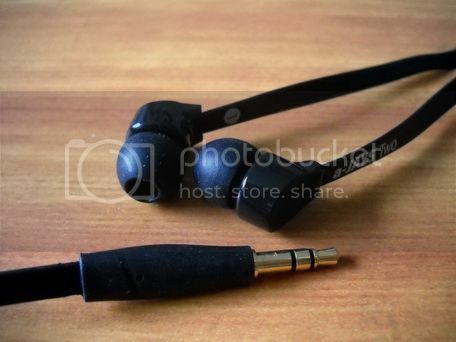 You can still wear it over-the-ear to cut down microphonics, but the flat cable isn’t the most suited for bending around. The good news is that once it is in place, the cable will stay in well because of its own weight. 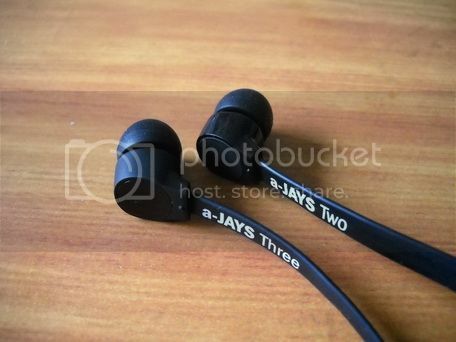 On the other hand, t-JAY has much thinner cable with two pieces design. The overall design is still fairly light and doesn’t feel to be ‘weight down’ as much as the a-JAYS. 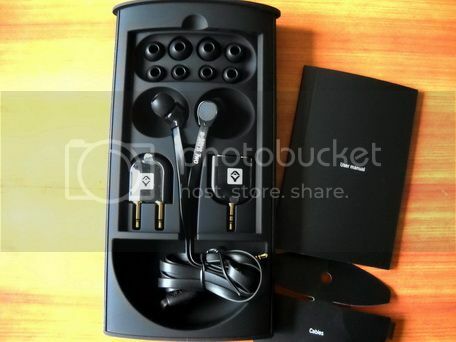 The only concern is the design of the ear pieces. It is very beautiful to look at and seems smarter compared to other side-porting solutions for large dynamic transducer (i.e. Sony MDR-EX700 or Radius HP-TWF11R). 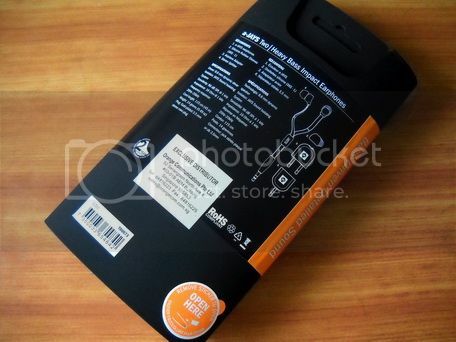 However, the angle of the housing and its nozzle means it might be a little more difficult for people with very small outer ears to get a good seal without the housing pushing against the ears. Though for most people, I reckon this shouldn’t be much of a problem. Another thing about the earpiece is that t-JAYS isn’t designed to be wore over-the-ear. The only way to do it will be to swap the channels, which is ridiculous. 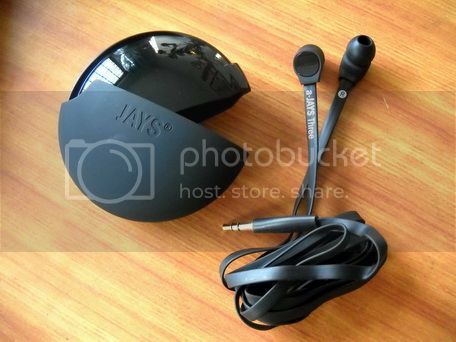 It would have been easier for JAYS to include a channels swapping adapter so wearing the IEM over-the-ears doesn’t mean a person has to listen to left channel in right ear and vice versa. Isolation wise, both a-JAYS models are about average while t-JAYS Two is just a little above average. Accessories wise, it is quite similar between the three models. 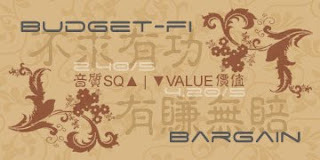 The basic stuff in the package is the 5 pair of eartips (XXS, XS, S, M, L). The 3.5mm splitter and airplane adapter are available for the Two and Three models, while the carrying case is only for the Three models. No matter which model you get however, there is still a very generous two years warranty. The new carrying case is better than the old tiny leather case that JAYS included with s-JAYS or q-JAYS on the fact that it is more spacious, but it falls short as the swivel mechanism becomes too loose after a few use and the case starts to open itself up in the backpack. It is good for stationary storage, but I would recommend something else for carrying around. 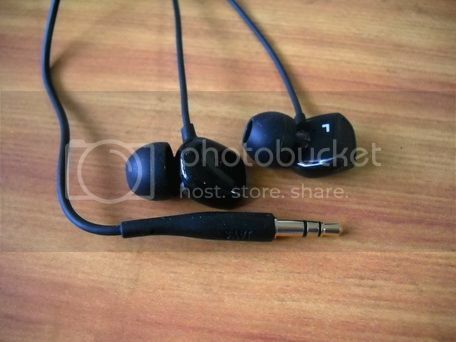 As usual, all three IEM have been given at least 50 hours of solid burn-in before the review. Being dynamic transducer based IEM and tuned toward the general public’s listening habit, one thing can be said is that none of these IEM lacks bass. In fact, it could be just a little too much bass in some model if you are not a basshead. So if you are a self-proclaim analytical listener or like others to refer you as a very serious audiophile, these more colored sounding IEM might not be best for you. Then again if you want to try something different, these are not that bad a choice either. 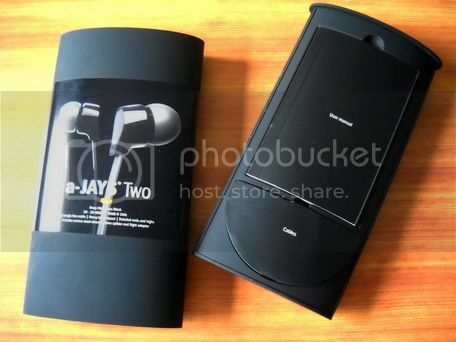 The overall sound signature of a-JAYS Two is very warm with big bass and smooth top. Bass reaches deep but bloated, though still within reason and has some control. Mid is full and has a decently sweet vocal. Treble does extend fairly high but in a smooth and sparkle-less fashion. Soundstage is average. Good for vocal and pop songs in general but not suitable for instrument or classical. An upgraded sound from the old Creative EP-630. 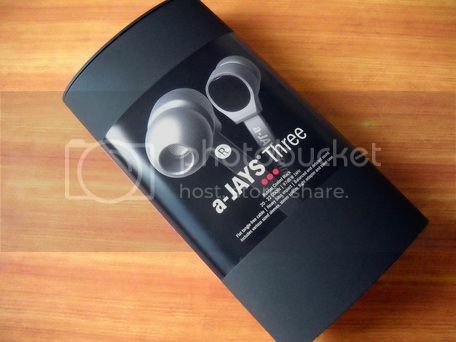 The overall sound signature of a-JAYS Three is warm, fairly balanced though biased toward bass. Bass has good impact and very decent amount, not quite as much as a-JAYS Two but still a little bloated. Mid seems slightly recessed in comparison which gives a better sense of space while still maintains a decent amount of texture in vocal. Treble also extends fairly high and with decent amount of sparkle and detail, not enough to be called analytical and there are still some rough edges, though nothing out of the ordinary. Soundstage is a little above average. Good for most genre of music but don’t excel in any particular. An upgraded sound from the old Sennheiser CX300. The overall sound signature of t-JAYS Two is warm to slightly dark, mid centric, smooth and just a little laid back. Bass has decent impact, quantity and control, though just a tad slow. Mid is well bodied and render a sweet, but not too sweet of a vocal that is good in texture. Treble has sparkle but in much smoother fashion, rolls off just a little at the top end and misses some of the highest note, but nothing terrible. Soundstage is a little above average. Good for most vocal based music, rock and pop in general but still performs instrument and classical in decent manner. A decent choice over the now discontinued s-JAYS. 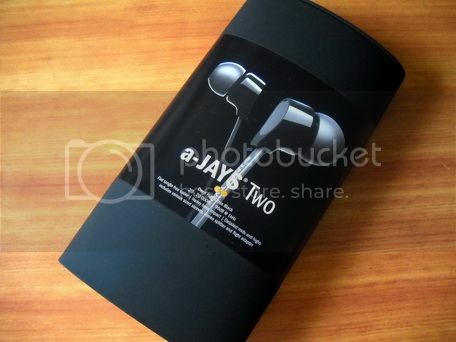 The current price of a-JAYS Two, a-JAYS Three and t-JAYS Two is US$50, US$60, and US$90 respectively. If you are in UK, you might be able to pick them up for cheaper price. This above rating is for JAYS a-JAYS Two only and may change without notice. Please refer to the list for a complete listing. This above rating is for JAYS a-JAYS Three only and may change without notice. Please refer to the list for a complete listing. This above rating is for JAYS t-JAYS Two only and may change without notice. Please refer to the list for a complete listing.